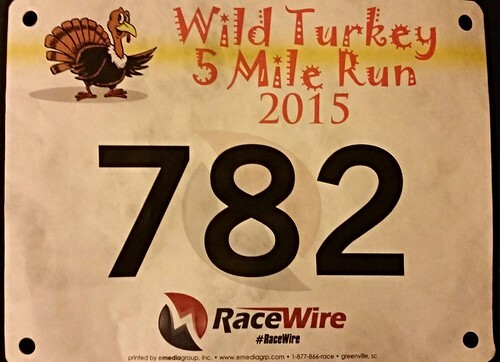 My race number for The Wild Turkey 5 Mile Run in Salem on Thanksgiving morning. I've run the Wild Turkey Run a few times since picking up running. It's a fun and giant race that many people partake in before going off to feast for the day. Given that I didn't end up doing nearly as many races as I have in the past because of time, money, and injury, I wanted to do one last solid race. My last race (a half-marathon in which I destroyed my previous timing and finally broke two hours) was pretty motivating and inspiring for me to try again. So I decided I would run this race hard and see where it put me. I did pretty well for myself. I ran the race in 42:15, which means I averaged 8:27 miles. This proved to be a personal record by far with previous 5 mile races being somewhere around 45 minutes or longer. So that's 2 races in a row with personal bests--I'll take it!